I was elated to discover that one of my favorite books of all time was being adapted for middle-grade readers. 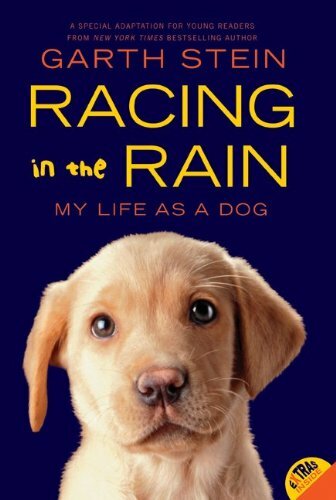 The Art of Racing in the Rain is a book that I longed to share with my students, but knew the content was much too mature for 6th graders. Alas, this new adaptation has made it appropriate for kids in grades 4-8. This book will make you laugh, it will make you smile, and inevitably, just like almost every other dog book out there, it will make you cry. But you already know the tears will come before you even get past the first chapter because the very first scene in the book is Enzo as an ailing dog, discussing his own morality. Because this is adapted from an already published book, the story doesn't flow as seamlessly as the original. The primary conflict in the story is a bit more vague and ambiguous due to the amount of content that had to be deleted to make it appropriate for younger readers. I also worry that younger readers won't identify with the story because it revolves around a thirty-something man and the demise of his family. Kids generally like to read stories about kids so I'm not sure how well they will respond to Denny as a protagonist (no matter how inherently good he is). Even with the criticism of what the book is lacking, the heart of the book is still there and that is the voice of Enzo the dog. He is such a unique, heartfelt narrator and kids really do deserve to hear his voice. That is the main reason why I was so pleased when I discovered that Stein decided to adapt this book for young readers. Not to mention the fact that this will be a book I can put in the hands of boys because of the racing aspect. Overall, I would say that if you have kids who you know like dogs and also racing, shove this book in their hands and they will devour it. Cover comments: While adorable, and certainly has the cuteness factor amped up, this cover really bothers me (along with some earlier covers of the original version). Enzo is not a purebred dog. Stein mentions several times in the book that he is a mixed breed and appears to have terrier in him. The dog on this cover is clearly a yellow lab. Obviously not Enzo! The book sounds to be interesting to me. And as you said the book cover is really adorable. This book is in my wishlist now. Thanks! I loovvee The Art of Racing In The Rain! I had no idea it had been adapted for middle school readers-- how cool! Every age group should be able to read this amazing book. I didn't know they adapted this book for middle-graders. Thanks for sharing!